Men In Black: International – Brand New Trailer! We live in a land of reboots and remakes and sequels. Navigating them can be treacherous. But we’re here for Tessa Thompson and Chris Hemsworth as the new alien fighting heroes. The film revolves around a woman who discovers the secret agency and has to fly to London in order to save the world. There’s a lot to process in this trailer, including it’s use of song. But we’re really excited. What do you think? Men In Back: International is out 2019! Transformers is a movie series that often procures a lot of ire. Never before has a bunch of films been so lambasted by film critics, industry folk, and audiences alike (this is a wild and outrageous generalisation but it works). Yet they still attract box office numbers, leading to six movies coming out. Yet the sixth installment, set in the eighties and revolving around one particular Transformer, has set a precedent by being a well-championed and well-received film. But is it worth all the chatter? Bumblebee revolves around the titular youngest and most rambunctious Member of the Autobots. After escaping from his home world, which is under siege from the Decepticons, Bumblebee is found, beaten, and left for dead. Disguising himself as a Volkswagen Beatle, and without a voice, it is years before the yellow-clad Autobot is found again. Flash forward a couple of years, and outcast Charlie, suffering from the loss of her father, discovers the car and decides to work on the project. However, what she finds herself in the middle of an intergalactic war. Having to teach Bumblebee how to be himself again, it’s up to the unlikely friends to save the world. Directed by Laika legend Travis Knight, Bumblebee has – ha ha – transformed the overblown franchise from an explosion-filled quip fest into an earnest Herbie-like adventure. The film’s focus on a sweet refreshes the franchise somewhat. There are moments of cute, family friendly comedy cut that appeal to your heart whilst also making you chuckle. The film has some incredible action sequences and great robot fights. Hailee Steinfeld is an accomplished actress. We’ve all known this since she exploded onto the big-screen with her Academy Award nominated performance in True Grit. Since she has excelled in fantastic movies including Begin Again, and the phenomenal The Edge of Seventeen. Her talent to reach into the depths of a character and pull out an emotional arc is impressive for this young actress. She smiles with unbridled joy and yet can map out the grief of a daughter lost without her father. It’s a fantastic performance for Steinfeld. There’s also John Cena as our muscular-bond disgruntled soldier. The biggest problem with Bumblebee is that it’s just average. Which is great for a Transformers film, but feels as though the story, the style – even the era – follows the same path as eighties inspired products that have come before it. It’s become boring and tiresome to see the same songs trotted out with the obligatory reference to The Breakfast Club written in there. On top of this, the adventure seems too familiar and isn’t embellished enough to pull it into pure greatness. Yes, it has capable components that work together to create a brilliant film and I’m not going to detract too much because for a family garb, it is genuinely impressive. But if you aren’t a huge fan of the Transformers series, this isn’t going to assuage you. Alfonso Cuaron is a masterful filmmaker. His glorious work transcends decades, genres, and communities – boundless in his intricate intimacy. From Y Tu Mamma Tambien to Gravity (with a magical pit stop at Harry Potter,) Cuaron has shifted and shaped genres with his stunning work. Now he brings us Roma – a truly astonishing piece of work. The film, semi-based on his own experiences, revolves around Mexico City in 1970 and 1971. It focuses on maid Cleo who works with an affluent family alongside other maid Adela. Head of the family is couple Sofia and Antonio, who are slowly going through a painful divorce and are keen to keep it from their three boisterous children. Cleo is also having a relationship with a young man and the film flows through snapshots of their lives all the while a rebellion is forming in the background. 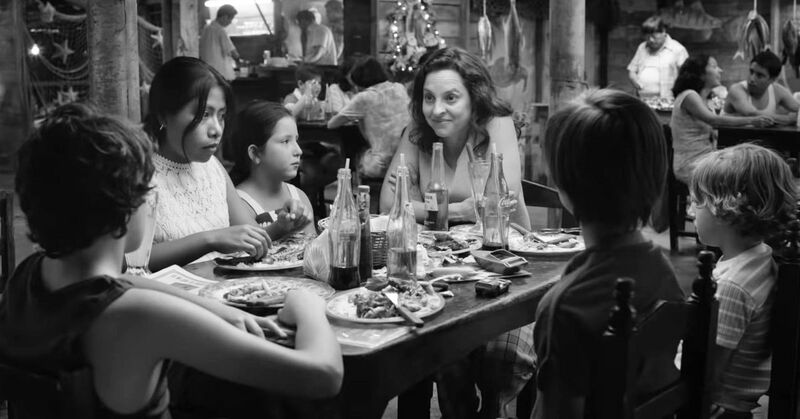 Roma is one of those films that has been constantly spoken about since it bounced around film festivals and many a (more accomplished) critic has tackled the beast with fervent glee and adoration. It’s hard to follow those review. It’s also hard to come up with better words that aren’t just “stunning,” “breath-taking,” and “perfect” all over again. The hysteria around Roma is warranted – it’s absolutely one of the most enchanting pieces of cinema around. Cuaron strips back to the mechanics of family life, told from the point of view of “the help.” Played with stellar naturalism by Yalitza Aparicio, an apparent acting novice, Cleo is this lovely and complex woman who has a kind nature that is boxed in by the world around her. As a live-in maid, she rarely has a moment of respite before she is washing the copious amounts of faeces of the drive-way or cleaning away the children’s tornado-like lives. Aparicio goes through grief and anguish and the work is excellent. It’s surprising this film is mostly improvisation, these non-actors bring an intimacy to these characters that is unparalleled with a lot of films here. The choice to shoot primarily in black and white is a bold choice and yet the absence of colour only enhances the vibrancy of Cleo and her world. Cuaron produces some impeccable shots and framing devices that will burn forever in your mind. Even if it is the first watery reflection of a plane overhead, mirrored in a later shot, or a burning shrubbery on fire that causes a wayward man to bellow songs. Cuaron has delicately and beautifully conducted one of the most visually appeasing movies that is redolent in its exquisite nature – burning into your mind with such a haunting presence. Roma has sparked off the Netflix verses cinema debate. There are those who vehemently believe that this stirring piece of art needs to be seen on the big screen. True, there are visuals here that call out for the big screen, moving with an equally captured audience. But Netflix’s cinematic release has eschewed the film to only a small set of screenings in the capital – it isn’t entirely possible for all of us to see it on a big screen. It’s funny. This is a film so structured in its portrayal of glass, whether it is the encompassing house with its crooked flat attached or a woman cleaning up the mess of a whirlwind rich family who then criticise the mess. It’s absurd that people who take away from this film a snobby attitude about where people watch the movie – negating how limited and expensive those screenings are. True, I have fallen prey to this behaviour and if you can see Roma in a big screen, then watch Roma in a big screen. However, your experience is not lesser at home. Regardless of how you see it, I cannot stress this enough – just see it. Turn off your phones, your lights, and snuggle in with a cup of tea just to absorb everything that Cuaron has poured into the story here. The intimacy, the texture, and the spirit of the film will surely capture you no matter the capacity that you watch it in. Roma is out in select cinemas today. It hits Netflix on 14th December!